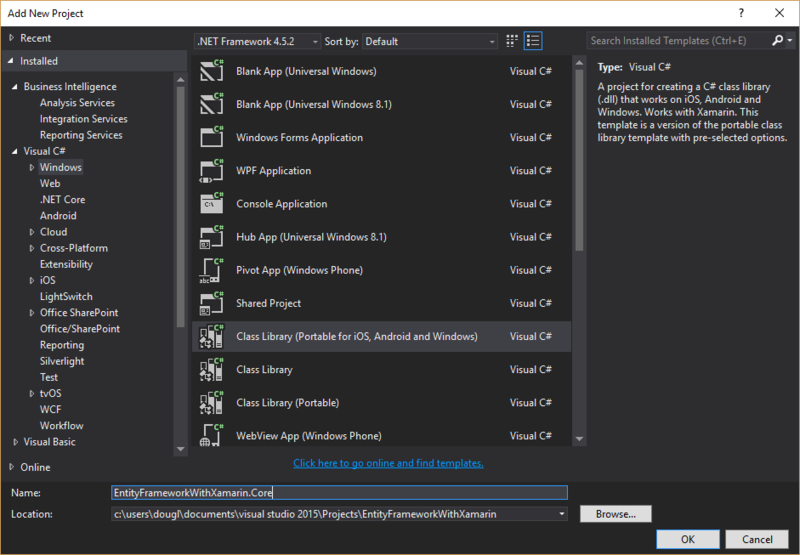 Entity Framework has been one of my favorite projects for quite some time. 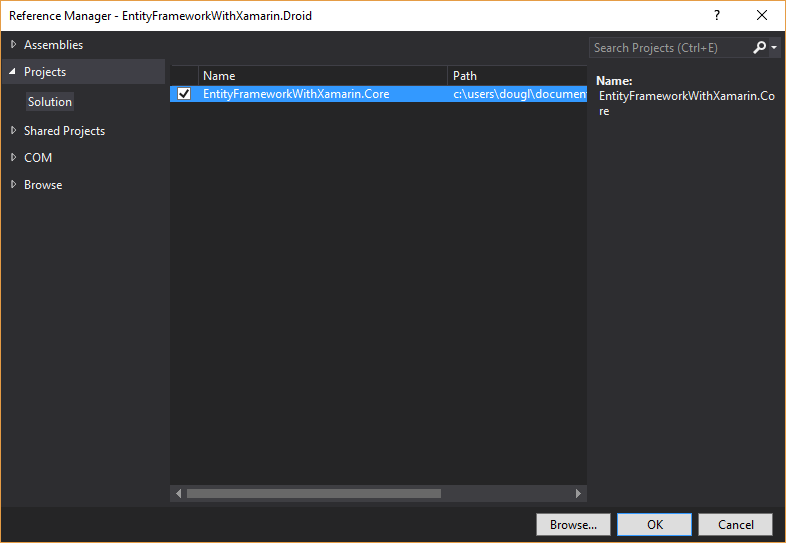 If you didn’t know, Entity Framework split off from the 6.X version to a new re-written 7.X (Core) version, in which the goal is to keep the ORM lightweight and very extensible. 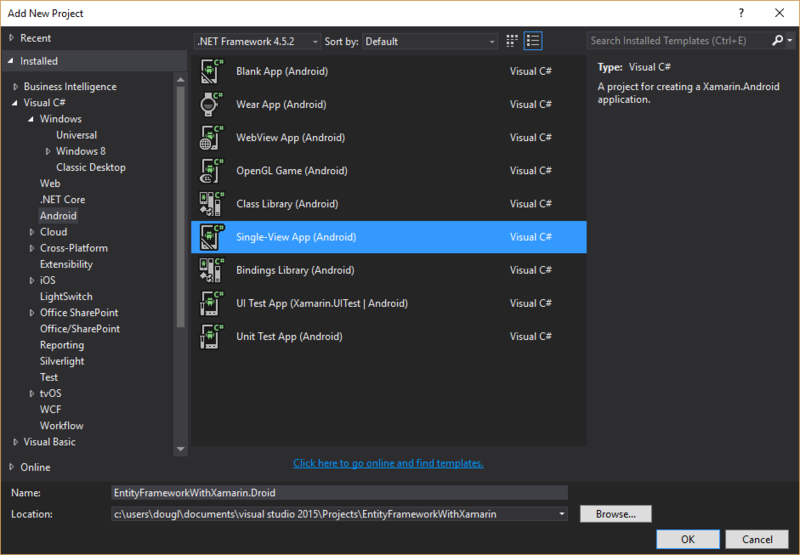 I want to use Entity Framework in my Xamarin projects. This hasn’t really been possible for the last 3 years. In fact, I’ve attempted it a few years back and gave up because the tooling was simply just not there. However this is my personal redemption at getting this to work. Great! Now we’re off to the races. 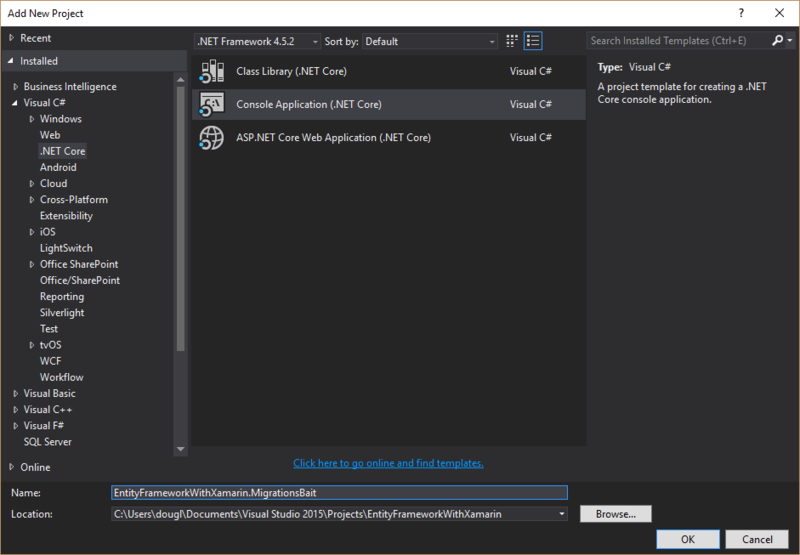 If you’ve used Entity Framework before, you will be very familiar with how we define a DbContext and our underlying Models that define our database schema. 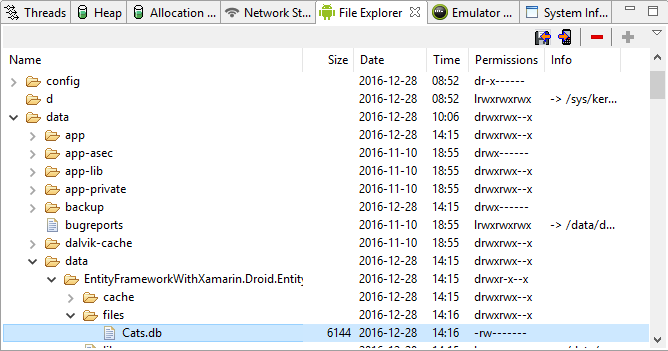 First, we need to make sure our Xamarin.Android project is referencing our netstandard library. 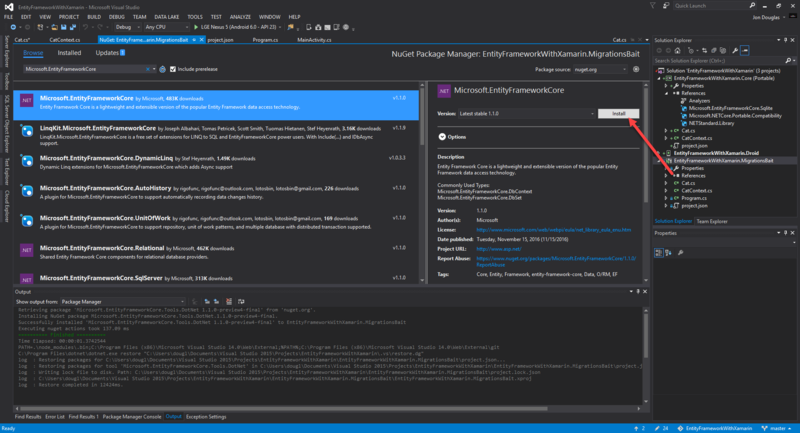 Now that we have that, let’s implement our MainActivity.cs with some Entity Framework code! await db.Database.MigrateAsync(); //We need to ensure the latest Migration was added. This is different than EnsureDatabaseCreated. 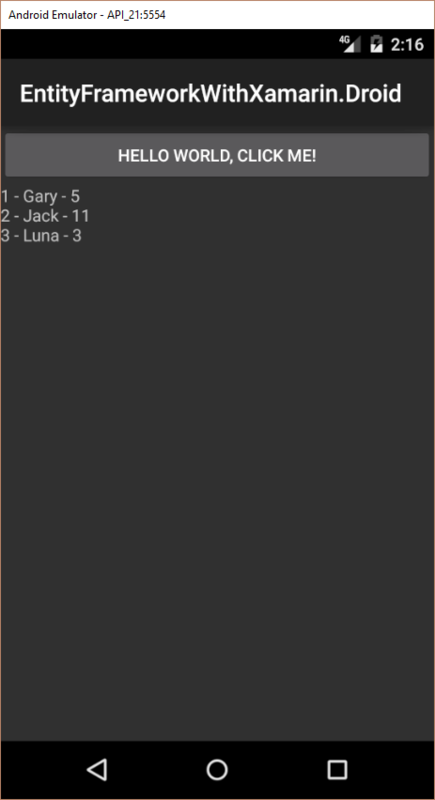 Let’s try to run this code. Microsoft.Data.Sqlite.SqliteException (0x80004005): SQLite Error 1: 'no such table: Cats'. 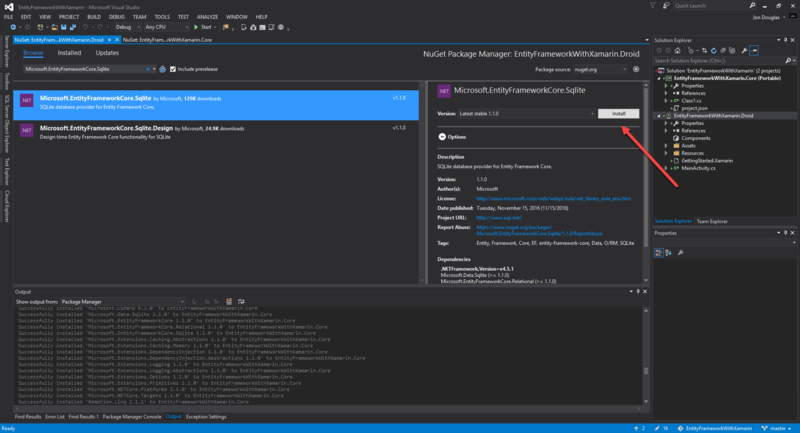 It looks like we’re missing a core Entity Framework feature, and that’s Migrations to create our database schema. Well shucks…this is awkward. 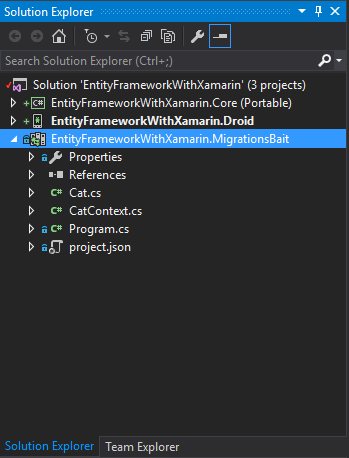 We don’t have a great way to generate Entity Framework Migrations from within a Xamarin.Android project or the netstandard library. 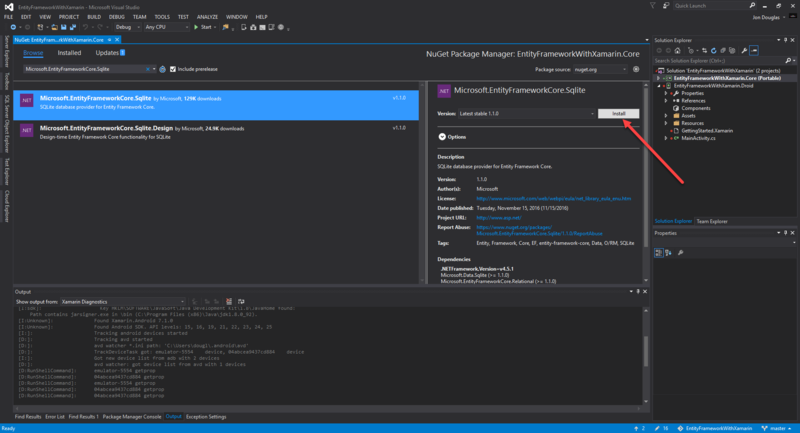 Let’s work with a quick workaround by creating a new netcore Console Application so we can generate Migrations. 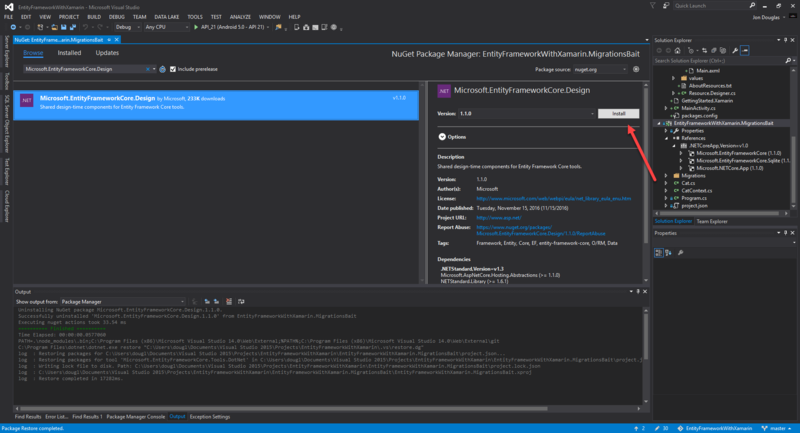 We need to add the Entity Framework Tools, Entity Framework Core Design, and Entity Framework Core to this project so we can use the command line to generate our Migrations. Now we need to generate an initial Migration. Now we need to take the initial migrations generated in the Migrations folder of our project and simply move them over to our netstandard library. Note: You can simply change the namespaces of these two generated files to the name of your netstandard namespace. It looks like it worked! Our simple attempt at adding Cat models and retrieving them works! Taking a closer look into the data/data/files folder, we will see our Cats.db that we created. 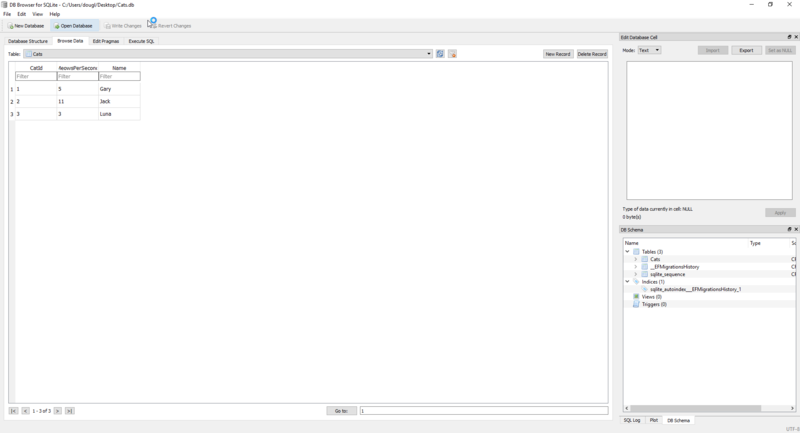 You can now take that file and open it in any SQLite explorer. 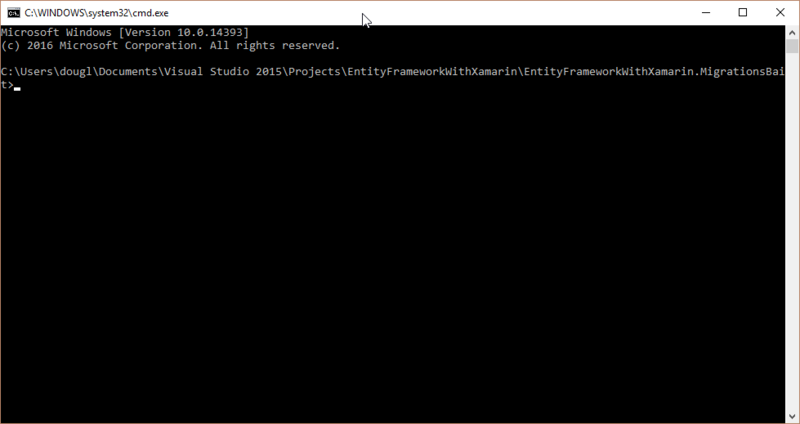 It’s been a three year battle with you Entity Framework. 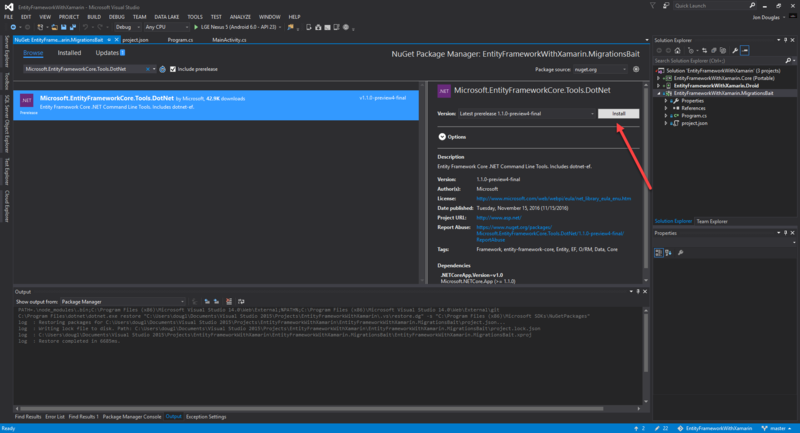 However I have to give my thanks to everyone involved in getting Entity Framework to the state it currently is. It’s been so much fun seeing how these projects turn out after a long period of development.